Openherd: Land of Legends Alpacas is a farm located in Newark, Ohio owned by Tim & Mary Jane Andersen. We are a small farm located in Newark, Ohio, approximately 40 minutes east of Columbus. We are very involved in using our fleece to make items for sale. We feel this is the future of the alpaca business and strive to breed for fleece improvements with every generation. 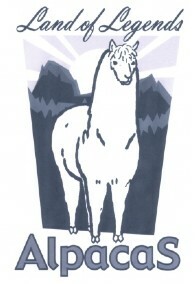 Call to schedule a visit and lets talk some alpaca! 25% down, 6 months same as cash. Possession when paid in full.